Ogden on Politics: After Supporting Wasteful and Likely Illegal Blue Indy Deal, Why Should Indy Conservatives Vote for Brewer for Mayor? After Supporting Wasteful and Likely Illegal Blue Indy Deal, Why Should Indy Conservatives Vote for Brewer for Mayor? 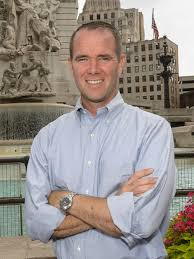 Chuck Brewer, Republican candidate for Indianapolis Mayor, has thrown the full weight of his campaign behind Mayor Greg Ballard's electric car sharing program, Blue Indy. Saturday, July 18, 2015, A Franchise Agreement For Blue Indy? Brewer apparently is unconcerned about the fact that the Ballard administration did not follow the law in the enactment of the Blue Indy contract. He also is unfazed about the lack of transparency in the Blue Indy deal and that valuable parking spaces before downtown businesses are being taken for charging stations. (We may well owe compensation for those lost metered spaces under the 50 year parking meter privatization deal entered into by Ballard.) Does the fact that Brewer is willing to overlook a lack of legal compliance and transparency on the Blue Indy deal suggest he would follow similar practices if elected Mayor? NBC Los Angeles reports that the state of California has awarded a $1.6 million dollar grant for Los Angeles to launch an electric car sharing program. The program will launch in some of its more diverse and low-income areas, including South LA and Koreatown. The pilot intends to add a fleet of 100 cars, with residents being able to sign up and pay a monthly membership or pay on a per-hour basis. While exact rates are still being worked out, officials are saying they hope it to be lower priced than car sharing services such as Uber and Lyft. While the report doesn't specifically say what type of electric car infrastructure that LA already has, I'm going to guess the answer is little to none. You can see some shots of charging stations being constructed in the background if you watch the news report clip on NBC-LA's web site. All in all, this works out to about $16,000 per car.In contrast, the electric car sharing program BlueIndy is costing nearly $50 million for 500 cars. That cost likely doesn't take into account the millions of dollars of lost revenue when Dictator Mayor Greg Ballard (R) unilaterally removes hundreds of parking spots from public use to turn them over to the exclusive use of a for-profit company. Or the massive fines ParkIndy, the private operator of our public parking meters, will levy upon the city for the permanent removal of the parking spaces. Despite the $6 million dollar in help from city taxpayers, don't expect that to make it any cheaper to rent one of these cars. A 2014 estimate puts the estimate at $15 for an hour, or membership fees at $10-15 for a week or an annual membership costing about $15 a month. Total costs work out to about $98,000 per car. $50 million for 500 electric cars in Indianapolis compared $1.6 million for 100 similar cars in Los Angeles. That's $98,000 per car in Indy versus $16,000 per car in Los Angeles. It is disheartening that Republican Brewer is endorsing a program that is such a colossal waste of taxpayer money. This is exactly why conservatives who are angry at Mayor Ballard for 40 plus tax and fee increases as well as limitless one-sided corporate welfare deals that fleece taxpayers are unlikely to turn out and vote for Brewer who is promising more of the same. This article underpins the very reason I call the backroom, away-from-light-of-day selection of Marion County special interest mayoral candidate Chuck “The Caboose” Brewer. Brewer publicly states he will be a “Greg Ballard third term”. Brewer publicly proclaims he will continue the illegal, lawless, and crony interest policies and politics of the train wreck we call Greg Ballard; Brewer is just another political trolley car atop the rails of the corrupt Marion County GOP. Along these lines explains why I call the liberal Democrat candidate for mayor “Lying Joe Hogsett”. Lying Joe says he is for public safety but I offer that in Hogsett’s refusal to go after the blatant corruption and lawlessness of Mayor Greg Ballard, the public safety has been harmed in ways Hogsett might have prevented had he marshalled the law against the City and corrupt big guns instead of the low hanging fruit of the Indy Land Bank. Joe is, IMHO, quite dishonest in his campaigning that he cares about Indianapolis “public safety” after he’s done so little to protect and promote it and hence the moniker I bestow upon him. There is a huge and important difference between a “Conservative” and a “Republican”; the terms are not necessarily interchangeable. Chuck Brewer is no “Conservative” in the way Greg Ballard is not conservative. When Greg Ballard began using and repeating the word “sustainability” at our GOP meetings, my ears perked up and I realized what a mental lightweight and political phony Ballard actually was. Ballard employed the word as an excuse to create bicycle lanes most of which are hardly used, bike sharing companies for his friends, and “green” cars that are not really legal to charge up with coal created electricity. Paul, you are on the nail head when you say Marion County GOP like me will not go out to vote for Brewer. I promised myself when Mitt Romney gave us Marxist Obama’s second term I would never again be forced to choose between poor choices served to me by party machines. What saddens me even more is that I am hearing on the streets that one of Brewer’s Primary challengers just might vote for Chuck "The Caboose" Brewer because “Brewer might be a good guy, I don’t know, I really don’t know him” and "if Brewer’s not elected we’d have a Democrat regime running the City and we don't want that, do we?” What? Seriously? After all that non-slated candidate went through, after all the many strategy discussions, after all the support many of us gave this non-slated candidate, etc., I am bowled over from what I am hearing. No wonder the liberal Democrats call Republicans “The Stupid Party”! Brewer and Hogsett are actually the same person; similarly, the local establishment Republican Party and local liberal Democrat Party are the same party…. And this blog proves it pointing out broken law after broken law and a Marion County Republican candidate who apparently vows to continue the same law breaking, little Caesar tyrrant behavior we’ve suffered with Greg Ballard. Why should any of us “little people” obey traffic laws, speed limits, etc., when the politicians can do what they want and make themselves and their buddies very, very wealthy on our dimes? Apologies for this over long comment. It’s just that we so-called grass roots Republicans- the ones DB, SDeW, Kyle and his minion Bryce kick the to curb- are completely disgusted by the corruption of the attorneys who run this town and who often violate their own oath to uphold the law. I clicked on the link to the Indy Democrat Blog regarding Blue Indy and read the nonsense titled "Opposition to Blue Indy Program Not About Idea ". Oh, really? The tyrannical imposition of this "government sponsored enterprise for special interests" is exactly why I am opposed to the theft of tax dollars for cronies in addition to the laws broken by corrupt politicians. I am again perfectly informed why I am not, and never will be (nor ever again vote for), a "Democrat". So Brewer is a SIR. Standard Issue Republican.